Kiwi Solo plants will produce tasty Kiwi fruits suitable for both culinary and dessert use. 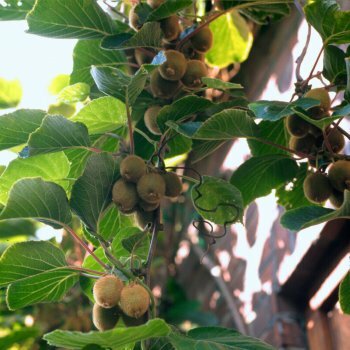 Given a sunny position and something to climb, this vigorous Kiwi plant can provide masses of creamy-white flowers in June followed by heavy fruit crops in winter (around January). A self-fertile Kiwi plant, Solo does not require a pollination partner. It also benefits from good disease resistance and is an excellent choice for the UK. Our pot grown Solo Kiwi plants can be planted at any time of year. Remove weeds and grass within a metre of your desired planting hole (preferably in a sunny position). Dig a square hole as deep as the root mass and roughly 3x as wide. To help it establish more effectively, we suggest sprinkling root grow in the hole. Gently loosen the plant roots and place into the planting hole. Using 50% of the original soil and 50% compost, fill in the hole and firm around gently. Make sure not to bank the soil up around the collar of the tree and ensure there is a support for the plant to grow up. If you’re planting in spring or summer, water the Kiwi plant well and regularly for the first few months and increase watering if there are extended periods of hot or dry weather. If you’re planting in autumn, you may only need to water a little.